OVMA | OACF Receives $20k for the Pet Overpopulation Program! 26 Oct OACF Receives $20k for the Pet Overpopulation Program! Last month the Oklahoma Animal Care Foundation received a call from Rib Crib (yes, that fantastic BBQ joint we all love) letting us know they would be donating $20k to the Oklahoma Animal Care Foundation for the Pet Overpopulation Program! Their annual golf tournament raised $100k to split between 5 local charities. Here is the press release along with some information about all the charities. A huge thank you goes out to Dr. Christine Kunzweiler who informed Rib Crib of the OACF and Pet Overpopulation Program. Also, thank you to Dr. Bob Poteet for representing the OACF at the check presentation ceremony. 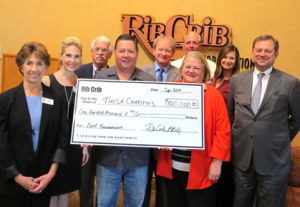 Thanks to your support, Rib Crib’s 14th Annual Golf Tournament raised $100,000 for local charities! We presented the checks last week and each charity was thrilled to receive $20,000! Even with torrential downpours, over 140 golfers teed it up for a good cause on May 23, 2016 to support The Community Food Bank of Eastern Oklahoma, Tulsa Zoo, The Children’s Hospital at Saint Francis, The Oklahoma Animal Care Foundation and 12 & 12, all local nonprofits dedicated to helping the community. Many of Rib Crib vendors supported the tournament as corporate sponsors, including Andreini & Company Insurance, Auto Chlor, Barcas, LLC, Curtis Restaurant Supply, Dr Pepper, Farmer Brothers Coffee, The Barkley Law Firm, The Holmes Organisation, Tyson Foods and Saint Francis Hospital. The Community Food Bank of Eastern Oklahoma is the largest, private hunger-relief organization in eastern Oklahoma. We provide food and other donated product to 450 Partner Programs in 24 counties of eastern Oklahoma providing more than 346,000 meals to hungry Oklahomans each week. Founded to welcome and foster charitable giving to The Children’s Hospital at Saint Francis and to provide and care for the special spiritual, emotional and physical needs of children and their families. Funds raised support pediatric care, programming and facilities for sick children, regardless of their ability to pay. The Oklahoma Animal Care Foundation is committed to improving the health and welfare of animals in Oklahoma through education, public service and disaster response activities. The Tulsa Zoo inspires a passion for wildlife in every guest, every day as one of the state’s leading wildlife education and conservation resources. Tulsa Zoo Management, Inc., a 501(c)(3) nonprofit organization, operates the zoo for owner the City of Tulsa. Funds from this event will help build a bigger, better zoo. 12 & 12 offers life-saving recovery tools for adults suffering with addiction or co-existing mental health and substance use disorders to achieve individualized recoveries. They are a leader in the substance abuse and addiction treatment and recovery fields and the largest non-profit addiction treatment facility in the four-state area. Please save the date for the 2017 Rib Crib Golf Invitational! Monday, October 2, 2017 @ the Oaks Country Club. We also wanted to share the amazing video and photos courtesy of Redeemed Productions as well as some updates!